Some authors use the name E. mesotrichus for this species, but this is an invalid name. This species belongs to the "E. carpathicus species complex", and its species status is unclear. The species has been regarded as a subspecies of E. carpathicus by some authors. More research is needed to clarify the status of this species. Albania, Bosnia and Herzegovina, Croatia, Greece, Italy, Slovenia, Turkey and Yugoslavia (Because of the species' unclear status, the reported distribution is also uncertain (reported locations might be for other subspecies of E. carpathicus)). I haven't found any data on habitat preferences, but I would expect them to resemble those seen in E. carpathicus. No medical data available, but data from other Euscorpius species suggest local effects only. Mildly venomous. Harmless scorpion, which rarely will use its stinger. Fet, V. & W. D. Sissom. 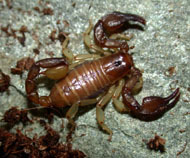 2000: Euscorpiidae. 355-382. In V. Fet, W. D. Sissom, G. Loewe & M. E. Braunwalder (eds.). Catalog of the Scorpions of the world (1758-1998). The New York Entomological Society, NY. 690 pp. Kinzelbach, R. (1975). Die skorpione der Ägäis. Beiträge zur systematik, phylogenie und biogeographie. Zool. Jb. Syst., vol. 102, 12-50. I haven't found any proper description of this species, except that it resembles E. carpathicus. Because of the lack of data, E. tergestinus is omitted from the Euscorpius identification key until data are available. This species is probably not kept in captivity.